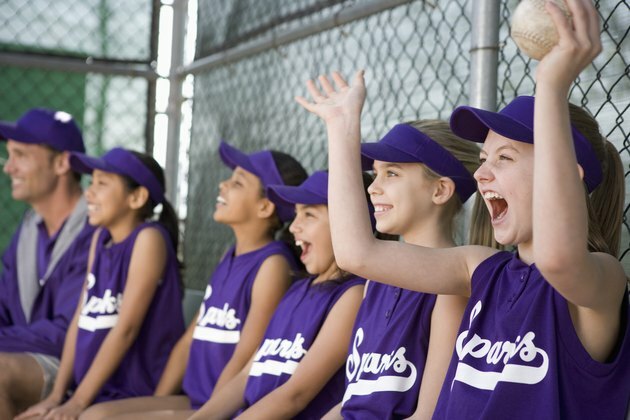 Girls’ fastpitch softball is a popular high school and recreational sport across the United States. It's even an Olympic Sport. The rules of fastpitch softball govern all areas of the game, including base runners. Base runners enjoy certain privileges but are also subject to certain restrictions according to the official rules of whichever body is governing the particular game being played. If the catcher drops the third strike, the batter is not automatically out, as is the case in slow pitch softball. The batter becomes a runner and must be put out by the catcher. This rule does not apply if first base is occupied or if there are two outs. If a batter interferes with a dropped third strike, she is out. The look back rule applies to all base runners, including the batter-runner, and requires all runners to either be on base or attempting to return to base when the ball is returned to the pitcher and the pitcher is within an 8-foot radius of the pitcher's rubber. A player between bases is allowed to immediately return to the previous base without risk of being put out, or try to advance to the next base, under risk of being thrown out by the pitcher. Any player on a base after the pitcher is within the 8-foot radius who then leaves her base before the ball is pitched is out. In order to advance to home plate and score, base runners must touch all the bases in order in all situations, including home runs. A player who hits a home run and enters the team area before touching all bases and home plate is called out by the umpire. While leading off is not allowed in fastpitch softball, players are permitted to steal bases, provided they do not leave the base before the pitcher has released the ball. Players who attempt to steal a base do so at their own risk of either the catcher throwing them out or the play resulting in a situation where the runner is tagged out on their original base, such as on a fly ball.